Range names can have either worksheet or workbook scope - this blog shows how to make sure that you're referring to the right range names! As so often, this blog was prompted by a question from someone on a recent course. To understand the question, it will help to step back a bit and explain what the problem is! Someone is now copying this sheet, by holding down the CTRL key while clicking and dragging on the worksheet tab. The formula is still the same, but it's now referring to the figures on the current worksheet. 1 Workbook The original range, on the Young sheet. 2 Worksheet The range on the copied Oldies sheet. 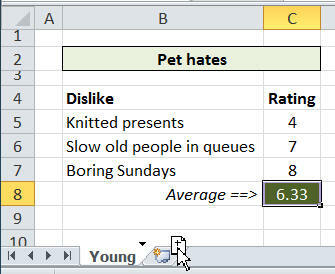 Click on this icon in the Formula tab of the Excel ribbon to see your range names. The range names have different scope. This brings me back to my original question: how to change the default range name used? 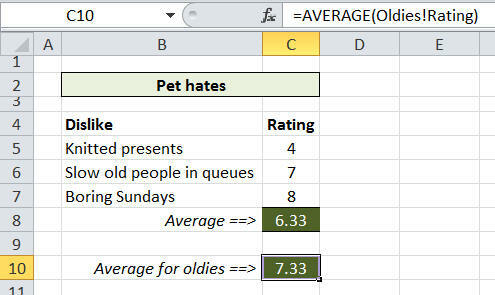 Here the formula used is =AVERAGE(Oldies!Rating), to make sure that we pick up on the version of Rating on the Oldies sheet, and not the default one with workbook scope. Here the formula used is =AVERAGE('Generation gap.xlsx'!Rating), because we want to refer to the range name originally created, rather than the local instance created for the Oldies worksheet. Perhaps the easiest way to avoid this problem happening is to avoid creating duplicate range names in the first place! 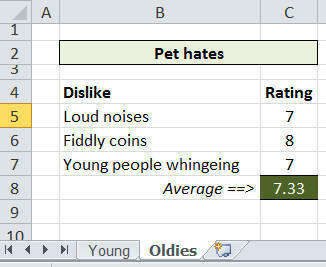 Thought you might be interested to hear about the following named range bug in Excel! We know each worksheet name has to be unique. Any attempt to name a worksheet that already has that name wil be met with an error prompt. The same applies to named ranges - sort of! Named ranges have two scopes, worksheet and workbook. Suppose I created a named range, say myname, at the Sheet1 level, referring to cell A1. Obviously if I try to create another named range called myname also at the Sheet1 level, the error prompt appears. Then if you attempt to create a named range called myname (and make it point to cell A2 of Sheet1) it will work! In doing so, it removes the original myname! I never knew that! Thanks.